Is your Android phone is very slow ? Got fed up with constants hanging of the phone ? Here is a nice app which will solve your problems. This app is freely available on Android market. The app is named as memory booster. Memory Booster is a powerful mobile memory & RAM boosting tool specially designed for Android smartphone users. 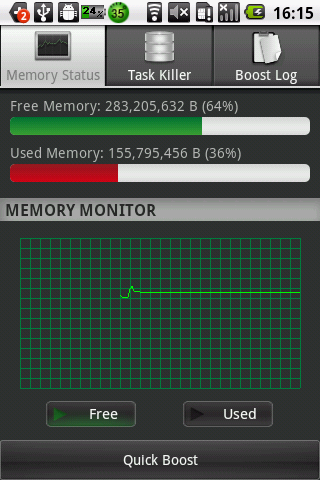 It is designed to tackle the difficult yet crucial problem of memory management for all Android devices. Memory Booster reclaims lost memory for your programs by defragmenting your smartphone's memory and recovering memory leaks from poorly behaved applications. 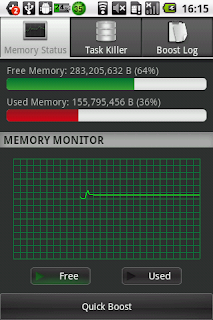 Embedded Task Killer, Whitelist Manager, Boost Level Manager & Memory Boost Log, also comes with Memory booster. check n provide sum trick.